Halo: Legacy of Onyx is a novel by Matt Forbeck released on November 14, 2017. 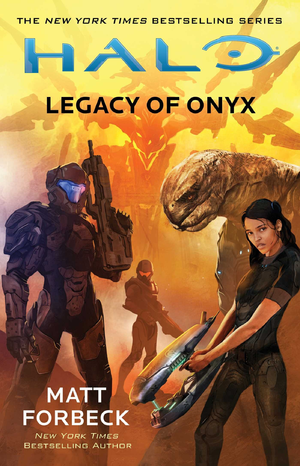 Set mainly in the Forerunner shield world Onyx, Legacy of Onyx follows up on narrative threads established in Forbeck's Halo: Fractures short story Lessons Learned. “ Molly Patel was only seven years old when the alien alliance known as the Covenant destroyed her homeworld and killed her family. As one of the few to escape the glassing of Paris IV, and despite the United Nations Space Command winning the war on behalf of humanity, Molly never forgot how much she had lost. Nine years later, when her adoptive parents—research scientists specializing in ancient Forerunner technology—are called to the mysterious and wondrous place known as Onyx, Molly vehemently objects. It’s not so much that Molly’s concerned about relocating to inside a spherical construct the diameter of an entire solar system, but the fact that she also has to live alongside members of the same alien species that murdered her family. The story begins with Molly Patel recalling the day the Covenant attacked Paris IV in 2549, when she was seven years old. Molly and her parents, without her older sister Grace, who spend the night before the attack in a friend's house, try to searching her in the house, but Grace and her friend's family already left. The Patel family tries to reach Mímir's spaceport, but the Covenant starts to glass Paris IV. Trying to escape the glassing beam, the Patel attempted to seek refuge inside a tunnel located at Cochineal Pass. Although the Patel barely managed to escape the glassing beam, their vehicle collides with the back of a truck inside the tunnel, killing Gotam and Brigid in the crash. Molly is later found in the pass tunnel by UNSC troops led by Sergeant Avery Johnson. On September 2558, Molly was living in Aranuka on Earth, along her "Newparents" Yong Lee and Asha Moyamba. One day, Yong and Asha came home early, informing Molly that they will leave Anaruka because they were hired by the Office of Naval Intelligence to study Forerunner technology on Sarcophagus, living alongside Sangheili and Unggoy from the Swords of Sanghelios. Molly roundly refuses to move with them because of her hate against those species and the Covenant as a whole, even if the Swords are allied with the humans, but when her Newparents mentions Spartans will be present to maintain the shield world secure from any threats, both internal and external, she reticently accepts the move, but plans to leave Sarcophagus when she turns 18. Inside Sarcophagus, a small battle starts near the Project: GOLIATH site, with Forerunner armigers appearing out of nowhere; Spartans Tom-B292 and Lucy-B091 are dispatched to handle the enemy forces. After the battle, they inform Franklin Mendez that the armigers were protecting the site, not attacking it. On Hesduros, Dural 'Mdama, "the Pale Blade" and new leader of the Servants of Abiding Truth, led his forces to the planet and makes an alliance with the kaidon of the Panom keep to gain access to the same slipspace portal Dural's father, Jul 'Mdama, used to escape from Sarcophagus five years ago. Days later, Molly, along with her Newparents and other families, are transported to Sarcophagus onboard the UNSC Milwaukee, a Poseidon-class light carrier repurposed as a civilian transport and refitted with some Forerunner technology recovered inside the shield world. On the ship, they are received by Doctor Hugo Barton, who fills them with the history of Onyx and some information about Sarcophagus. After settling on Paxopolis, Molly and her Newparents are visited by Mendez, Tom, and Lucy. After being dismissed, Molly hides to hear what the Spartans, Mendez, and her Newparents are talking about, hearing about the incidents happening on Project: GOLIATH's site and how it is repeating itself on several human colonies, and some internal problems between the humans and the Sangheili inside Sarcophagus. After hearing that, Molly interrupts the discussion to express her opinion on how hard it is to get over the ghosts of the war. During the discussion, Molly notes Kasha 'Hilot, headmaster of the Pax Institute, is outside her home. Although initially reluctant, Molly greets Kasha, with both talking about the Institute and its students. Kasha hopes Molly and her family became good allies with the rest of Paxopolis, but Molly is not very convinced of it. On Hesduros, "Pale Blade" orders to some of his forces to bring Even Keel, a Huragok, to fix the slispace portal near Panom, and, as a sign of "gratitude" to Panom's kaidon, he leaves behind a complement of vehicles and weapons for Panom's warriors in case the Swords of Sanghelios show up again. After crossing the portal, "Pale Blade" and his forces arrive inside Sarcophagus, where he has a heated discussion with Buran 'Utaral, and recalls his mother's death, the disappearance of both his father Jul and his brother Asum, and his recruitment into the Servants by Avu Med 'Telcam. The Servants establish a base inside a Forerunner facility and take notice of a pair of Marines, who were exploring the surroundings; "Pale Blade" orders them both killed and the facility secured. Dural kills one of the Marines himself, noting she is technically the first human he has ever slain. Once settled into her new home, Molly begins to attend the Pax Institute. It quickly becomes apparent that despite the unique location and situation, the school is little different from any other, much to Molly's displeasure. The school is large enough to allow her to avoid interacting with most of the other students, especially the alien ones. She observes she is not the only student to attempt this, as a trip through the school lunch room shows. Students segregate by species. This leaves her sans table, however, and without hesitation, she simply takes an empty one for herself, declaring herself "Molly Patel; nation of one". Her self imposed exile does not last long, however, as another human joins her; Klareem El-Hashem, who turns out to be a fellow self-imposed exile and a survivor of the Covenant assault on Luna in the Sol system. Warming to Molly with sarcasm and the commrodare of the lonely, they chat over lunch and then exit into the school's courtyard, he reveals his mother is an expert into Unggoy culture and Kareem came along with her when she was invited to Paxopolis to study the local culture of Unggoy that have settled there. One of them joins moments later, cheerfully introducing herself as Gudam Keschun. She, like Molly and Kareem, is a sort of outsider, and the daughter of one of the math teachers at the Pax Institute. Molly, at first a bit wary, actually warms to the Unggoy, though a bit startled by their biological differences from humans as a whole. The three's friendly bonding session is broken rather abruptly by an incident of cross species bullying. Three humans, who Kareem introduces as Karl and Zeb Zakovsky and their friend Andres Malez, are picking on a young Sangheili male who doesnt seem particularly interested in defending himself. Kareem notes those three are the biggest bullies in the school. The three watch the altercation between the humans and the Sangheili, which rather quickly turns aggressive and threatening. Gudam attempts to break it up, and Karl instinctively lashes out at her hard enough to draw blood and knock her breather pack off. The altercation increases the tension between the Sangheili and Karl, and Molly steps in to break it up. The confrontation quickly devolves into a full on brawl that is only broken up by Dinok 'Acroli, another Sangheili instructor at the school. The parents of those involved in the incident are brought in, and Molly comments on how this is the worst first day of school ever. Luckily for Molly, her Newparents aren't too upset by what happened. Instead they are proud of her for standing up to a bully. She and Kareem both get suspended for a day, the bullies sent home for a week (though rumors whisper their parents took them out to dinner), and the Sangheili and Gudam are left alone. The incident does loosen her Newparents' lips about why they are inside the Shield World however. They explain a little bit about PROJECT: GOLIATH. The project is focused on a gigantic Forerunner machine that Molly's Newparents discovered and explored on a colony world; there are more of them, they're becoming active, and ONI wants to know why. They ask Molly to help them by staying in school and not getting into trouble, leaving them free to work on their research. They then leave for the day, and end up staying the night on-site, leaving Molly alone in the house. She decides she doesn't really want to go back to the Pax Institute, but she receives a surprise visitor; Lucy. The Spartan explains the reasoning behind why Molly should go back to school. She also reveals that the Sangheili male Molly helped save is named Bakar, and she offers a deal; if Molly goes back to school, she and Tom will teach Molly self-defense lessons. Molly accepts and heads back to the Pax Institute the next day. Finding herself shunned by the majority of the students, Molly decides to simply make it through her schooling and leave at 18, as she originally planned to do. She receives thanks from Gudam's mother during her math class however, and sees Gudam herself, none the worse for the wear following the fight. She invites Molly over for dinner, skating over Molly's various objections. During that day's lunch period she attempts to avoid both Kareem and Gudam, but finds that the only other table with any open seats is taken already by Bakar. Having nowhere else to go and having crossed the social point of no return, she seats herself at the table as far from him as she can. The two exchange heated words about the fight the day before, Bakar stating that Molly made him look weak for stepping in to save him. Molly counters she stepped in to save Gudam, not him, and a moment later Gudam herself shows up, followed by Kareem, attempting to make friends with Bakar. In response, the Sangheili storms out. The three settle into the table, now theirs, and finish their lunch. They contemplate why the bullies picked on Bakar, but no answers are found. In the Forerunner structure the Servants of the Abiding Truth soon come to call "The Cathedral" (shorted from "The Great Cathedral of the Esteems Avu Med 'Telcam"), "Pale Blade" settles in to begin assaulting the shield world from the inside out. Over several days, they turn the facility into a citadel, installing gunnery stations and armories and command and control equipment, as well as shuttling all the vehicles they can through the portal from Hesduros. The Sangheili within it grow restless quickly, however, sparking arguments between "Pale Blade" and Buran. "Pale Blade" reveals that the next step of the plan is already in motion; the groups Huragok, Even Keel, has located another of its kind, working at a place known as the Repository. "Pale Blade" aims to capture this second Huragok and use its knowledge of Onyx to his advantage. To do so, the Servants will utilize "utter chaos". Out in the field around the same time, Tom and Lucy investigate the sign of a disturbance. One of the Huragok has noted that a sensor was tripped at the facility Jul M'dama used to escape the shield world, and the two Spartans investigate on Jackrabbits. They encounter and easily dispatch a group of Sentinels around the facility with their vehicle's machine guns, and then investigate on foot. They spot tracks left by a Sangheili, and Tom notes that either its a field trip from Paxopolis, or they have a breach. The latter seems more likely, and Lucy comments on their lives getting a lot harder. Back at the Pax Institute, Molly eagerly goes to her first self defense lesson with Tom and Lucy, only to find that its not the private session she originally envisioned. Kareem, Gudam, and Bakar have all been pressed into the class as well. Molly argues with this, but Tom and Lucy both quickly shoot her down with the logic of soldiers with decades of field experience and an entire Spartan Company's worth of recruits trained. They give her the bottom line; train with the others, or not at all. Molly accepts, realizing that its not her opponent that she has to change, its herself. Though pleased with the self defense class, Molly's life at school has become much more complicated. Effectively shunned by the majority of the school still and almost babied by Kasha, she finds herself with Kareem and Gudam more often than not. Even her parents are distant, busy with their project, but not enough that Asha can't give her a kiss goodnight and tuck her into bed, though Molly thinks that (at 16) shes far too old for that kind of thing. The next day, she and her entire class of about 50 students take a field trip to a jointly secured facility known as the Repository, a Forerunner hanger of sorts now also used to store human, Covenant, and hybrid vehicles of all forms. The facility is beyond the Inner Barrier, the sensor-laden security ring around Paxopolis and the majority of the settlements, and situated in the far less populous but still mostly secure Outer Barrier, along with her Newparents work place. Kasha warns the group to be careful, as Onyx is so large there still may be dangers lurking in the area despite the UNSC's sweep and clear. The transport follows unofficial school bus rules, and as such, Molly is stuck in the back of it with her two friends, and Bakar. The Sangheili reveals that he, like the other three, is kind of an outsider, having been sent to Paxopolis to avoid things happening on Sangheilios with his family. The four bond over their shared life situations. Arriving at the Repository, Molly and friends are introduce to Mike Spenser, liaison between the Pax Institute and ONI Research Facility Trevelyan. Laying down a few ground rules, the former ONI agent lets them run free. Molly and crew explore the facility, admiring the vast collection of assorted vehicles there. She recognizes many, but some are too obscure even for her to recognize, and notices hybrid vehicles of both Covenant and human design with Forerunner elements. The class's expedition is rather dramatically interrupted, however, as a massive six-legged creature appears within the structure and proceeds to begin wrecking everything in sight. Spenser assaults the beast, but it shrugs off rounds from his sidearm easily. The beast proceeds to go after Spenser, destroying every vehicle in its path. The ONI agent avoids it, barely. Escaping outside, Bakar identifies the creature as a rafakrit, a mythical beast of Sangheili lore. Kasha derides him for believing it to be real, then realizes he is in fact right. The local security forces of the base engage it, but it cuts through them easily. Kasha leaves the students to go distract the beast and save Spenser, managing to do so and draw it away from the former ONI agent, only to get caught in the beast's sights herself. She almost escapes, but injures her leg in the process. Remembering something from the stories of his childhood about rafakrits being afraid of high pitched noises, Bakar (through Molly's cajoling) has Gudam shriek to pull it away from Kasha. It works; but the beast comes towards them instead. The four engage in a running evasion battle, drawing the monster away for a good five minutes and are almost killed until Spenser arrives with the heavy ordnance; a Gauss Warthog. The M68 ALIM on the LAAV easily punches through the rafakrit's natural armor and kills it straight out. Shaken, but alive, the four teenagers realize just what happened...and Kareem notes that whoever mentioned rafakrits were afraid of loud noises had wanted anyone who made them to die instead. Molly realizes that the four of them are, in effect, now friends, and decides that if what they had just been through didn't make them friends, she wouldn't know what would. The novel's cover is illustrated by artist Benjamin Carré, who also provided artwork for Halo Mythos, and illustrated Halo: Retribution's cover. The novel first appeared on Simon & Schuster's website. However, the listing was taken down, then relisted on Amazon and again on Simon & Schuster several months later before its formal announcement.